A performance by an Israeli dance group in London was disrupted on Monday by demonstrators protesting against Israeli air strikes in Gaza. Protestors stood and shouted at Sadler's Wells theatre before being swiftly ejected by security staff. The audience applauded and cheered during protests in support of the performers. 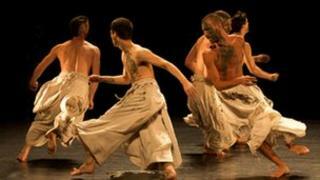 A Sadler's Wells spokesman said the dancers of the Batsheva Ensemble had continued with their performance. A smaller protest also took place during Tuesday night's performance. "Batsheva Ensemble are the youth company of one of the world's most accomplished and innovative dance companies," said Alistair Spalding, chief executive and artistic director of Sadler's Wells. "Therefore it is absolutely right that they should be presented within our artistic programme. "We believe in engagement, not disengagement or boycott," he continued. "Cultural isolation is not a policy that Sadler's Wells believes in." Campaigners said they were not protesting against individual Israeli artists but against their government. "Our message to Israel... is that institutions linked to the state, including cultural bodies like Batsheva, cannot expect to be welcomed as if they represented normalcy," said Naomi Wimborne-Idrissi of the Boycott Israel Network. Before Monday, 11 of the the Batsheva Ensemble's UK shows have been interrupted since the company began touring in August. More protests are planned when the Tel Aviv-based group reaches Plymouth on 23 and 24 November, the final dates of its UK tour.